Started in April 2004, LET'S RIDE! has built up a reputation for outstanding pass rates and quality, fun tuition. Chief Instructor and director, Richard McPherson, has been riding bikes for over 25 years, both on the road and the track and is a fully qualified Driving & Vehicle Standards Agency (DVSA) approved instructor for Compulsory Basic Training (CBT) and Direct Access (DAS) and is also an Advanced Riding Examiner for the Driving Instructors Association (DIA). Richard has also successfully passed the DVSA Special Test for Motorcycle Instructors - a rigorous 90 minute examination in machine control, road craft and hazard awareness. LET'S RIDE! train for the Poole & Bournemouth (Dorset) test areas plus Dorchester, Salisbury & Lee-on-the-Solent if required. 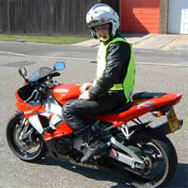 Compulsory Basic Training (CBT) courses are held on weekends and Bank Holidays, from our location in Wimborne.